In harmony with nature and the gods, Taman Wana Villas & Spa combines the seclusion of the village retreat with the style and personalized service. Stylish an elegance of the Taman Wana Villas & Spa, with a unique blend of rustic and natural materials. 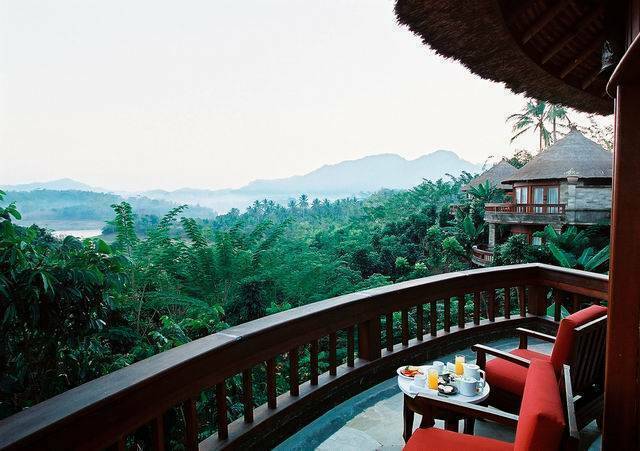 From the breathtaking mountain forests, the villas are located on 80. 000 meter square above Palasari Irrigation Dam. Overlooking rice field, distance ocean view, lagoon, and green mountain all year around, a large swimming pool is set in the middle of the propertys extensive gardens which feature a natural coconut grove. The location 28 minutes by helicopter or 2 hours and 30 minutes by limousine from Ngurah Rai International Airport, 30 minutes by limousine from Gilimanuk or Negara City. Palasari Suite, 3 bedded rooms (300 square meters ) The spacious Palasari Suite is located on the hilltop, overlooking the valley lagoon, tropical mountainous rainforest, coconut grove, private swimming pool, large balcony surround the suite to allow for outdoor dining, entertaining, lounging or as a sundeck. The rooms are furnished with a living area and large entry hall, bathroom, bathtub, separate shower, dressing rooms, Jacuzzi and Spa. BLUE LAGOON VIEW VILLAS, 1 bed room(100 square meters) Located at upper level of the lagoon, all guests rooms are housed within two story building with ethnic combination traditional architectural to emphasize the balance of the nature and style. The villas are designed to maximize the views, of the valley lagoon, tropical mountainous rainforest, coconut grove, large balcony, bath tub and outdoor shower. COURTYARD VILLAS, 1 bed room	(80 square meters) Located on top of the secluded intimate hideaway hill, upper level of the rice field. 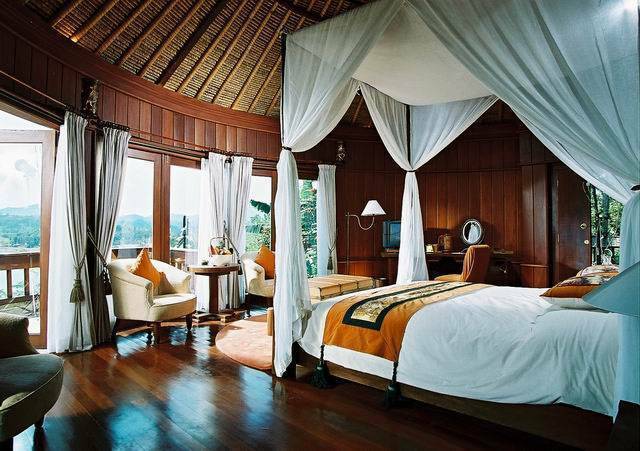 All guests rooms are housed within two story building with ethnic combination traditional architectural to emphasize the balance of nature and style, and maximize views of the coconut grove, rice field and distance sea. Naturally landscaped garden surround the villas, large balcony and separate shower. The Taman Wana is unfailing in its support of the environment as well as the local communities of West Bali, a large part of which is occupied by the Bali Barat National Park. Unquestionably Bali¹s richest ecosystem, the 777-square-kilometer reserve lies just 20 minutes away by car or one hour away by foot. The eight circular-shaped villas hark back to a form of architecture first carried to the island by pre-Hindu settlers from Polynesia over one thousand years ago. Each of the individual structures, built of gorgeous teakwood and set at different levels and angles, exude a character all their own. Lying on the border of a major national park, the jagged peaks of Klatakan and Batugenteng tower on the horizon and lend the location an untamed atavistic beauty. All that you see before you is closed to development. Stars crowd out the sky at night. Payment in full for all charges. All account are to be settled upon departure. Should the booking cancelled within 14 days, 1 nigh accommodation booked will be charged( 30 days for high season). Should the booking cancelled within 24 hours, a 50% of full duration stay will be imposed. 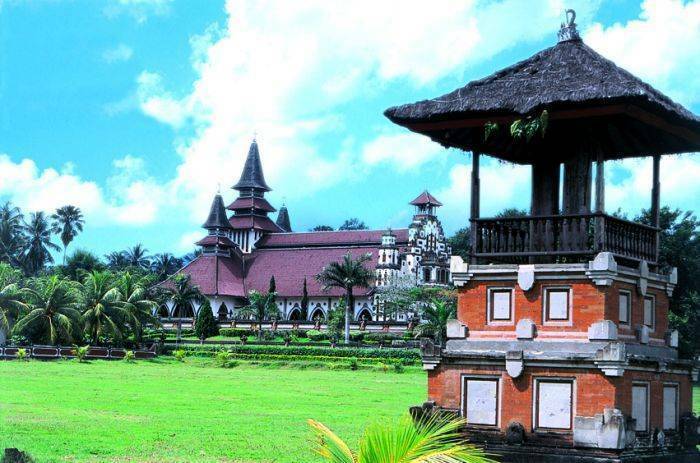 Transfers airport Hotel Airport or ex any hotel around Bali can be arranged through our concierge at USD 60. 00 per car, for one way transfer for capacity of max. 4 persons. 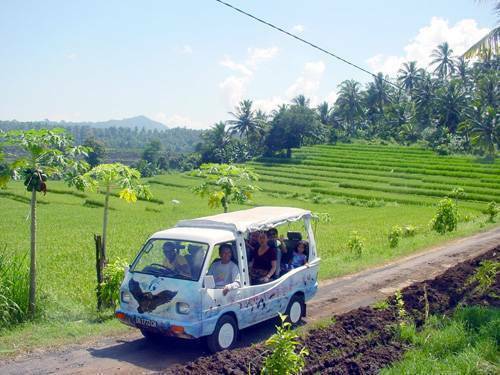 Nearest airport: Ngurah Rai International airport is approximately 100 kilometres away and drive usually takes about 2 hours and 30 mins and 28 mins by Helicopter from our own Helipad in the middle of our rice field.